When Matt was 16, he applied to work on the High Ropes Course at Camp Shamineau near his home in Brainerd, MN. Normally, they didn’t hire anyone under 18, but the ropes course director, Bart, took a chance and hired him anyway. 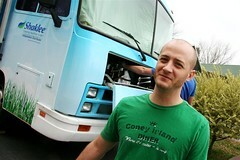 Bart and Matt’s friendship quickly blossomed and Bart has remained a mentor throughout Matt’s life. The last time we saw him was when he stood up as a groomsman in our wedding. We were so excited to reunite in North Carolina after not seeing him in 7.5 years! 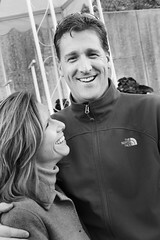 Bart has recently proposed to Diane, a news anchor in Raleigh. We had a fun time getting to know her better and hanging out with them for the weekend. What a blessing it was to spend time with Patrick, Jen, and two of their children (Luke and Lauren) in Raleigh. Jen is a self-professed “former vegan hippie” who is now finding her way back to her roots . 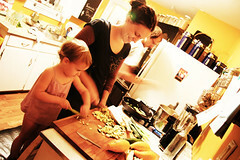 She’s a homeschooling mama of four who has a kind, generous spirit. I’ve enjoyed getting to know her through Walk Slowly and was excited to meet her in person. We were welcomed with open arms into their warm home and fed amazing, delicious vegan food (check out the photos!). The next morning, Jen made MORE yummy food … and we sipped tea and coffee while looking out the windows to their backyard. They live in a really pretty wooded area…complete with a HUGE (and I mean huge) tree swing that lofts you out into the trees (and tree with colorful leaves STILL on them!). Fun! We are planning on getting together with them again when we fly back into Raleigh after the holidays. 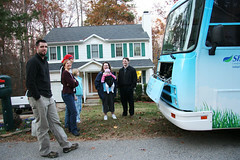 When we were in Greenville, I got an email from Jenny asking if we could stop by their house on our way through Charlotte and show them the RV. The timing worked out perfectly, and we were able to spend a night visiting with them. Jenny’s husband, Ben, is a member of the band “Scotty Don’t” and they spend a lot of time touring around the country with their two children. 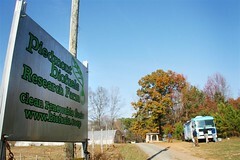 They have an RV already, but they are looking for a more environmentally friendly way to do it. We had a great time hanging out with them…meeting their friends…eating good food…and of course, playing princess. Chris, Jen, and Bryce are fellow travelers AND Volkswagen lovers…so of course we liked them from the start! 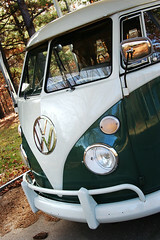 (For those that didn’t know, we used to own a delightful 1977 Westy). They went on their own cross country journey about a year ago in a VW Bus with their 2 year old. You can read all about it at “We Stay Gone”. We had a great time in Greenville with them…Bryce and Bella had fun playing, fighting over toys and chasing each other around the yard. They have a gigantic Great Dane as well…gorgeous. They showed us around the beautiful downtown area and took us to the Mellow Mushroom (a delicious little spot) and out for ice cream and coffee. It was so odd to see Christmas lights in all the trees…but no snow! There is a really neat suspension bridge and park downtown. It’s a fun walking area. I also had the chance to meet another friend while we were there. Kate came over with her kids to check out the RV…and then we all went out for coffee at Port City Java. It was so fun to put names with faces! Ecoerin Sponsors the Live Lightly Tour! For the rest of our tour, we are going to smell REALLY yummy!! In fact, we’ll smell like Orange Patchouli….and Cinnamon and Cloves…and Lemon and Green Tea. Weeeeee! 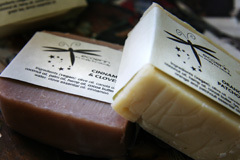 We’re excited to announce that Ecoerin will be providing natural, fabulous handmade soaps for us to take on the road. If you are a bar soap lover (and if you aren’t, you should be! )…you will love Erin’s soaps! Be sure to check her site out…she is offering a 10% discount for Live Lightly blog readers…so be sure to get your order placed in time for Christmas delivery! I had been looking forward to our visit to Asheville for a LONG time! Everyone had been saying for months how much we would love it there…how fun it was, etc. It didn’t disappoint. We met Charlie and Angela (from Johnson City) there for a Saturday of fun. 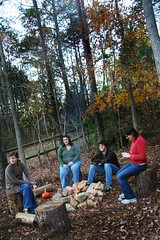 It was quite chilly out…but we bundled up and enjoyed the brisk autumn breezes. The first stop was The Laughing Seed. Oh…the deliciousness abounds. All vegetarian…all yummy. I ordered the hemp seed burger…and it was great! The restaurant was SUPER busy (they said it was their busiest weekend of the year! )…but that just added to the experience. There were more dreadlocked people in there than I have ever seen in one place, ever. After lunch, we just walked around the downtown area and checked out all of the little shops. My favorite store was Terra Nova Decor…with decor, clothing, and other goodies from all around the world. 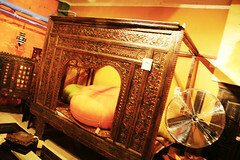 I completely fell in love with an amazing Mongolian bed and platform couch. Oh…the love. 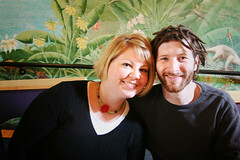 We saw many other cool things…from art to incense…before stopping for some coffee and pastries at World Coffee Cafe. We had so much fun running around town with Angela and Charlie…it’s always more fun to do things with friends! As we headed to Asheville from Nashville, I emailed my friend Becky in SC and asked her what we should do while we were there. She immediately told me that we HAD to stop and see her friends Kris and Natalia!! Natalia was a “friend” of mine on MySpace and a real-life friend of Becky’s. And boy am I GLAD that we made plans to stop and see them…it was such a blessed time. We arrived in the dark…we should know better, but it just happened that way. The dark made it a little hard to locate their house…but we kept driving and talking to Natalia on the phone until we saw her waving at us in the middle of the barely lit street. I jumped out and helped Matt get the RV all situated…and then we all headed inside where a delicious dinner was being prepared. My first impression of Kris and Natalia’s home was “I want this house!”. It’s so cute, warm, and homey. The colors are so rich and wonderful…you just want to stay forever. They have a beautiful property…with the perfect spot for our RV. We really COULD have stayed forever Bella made friends with the girls quickly and they were soon exchanging shoes and clothes and hugs. They have a great playroom in the basement…it made me want to be a little girl again! Shawn and I met in Akron, Iowa when I was…well…young. I can’t even remember how long it’s been. I think we’ve probably known each other for over 20 years. Scary. Our families lived across the street from each other…and when we moved to Waverly, Iowa, Shawn’s family moved there too. Our lives and families have been intertwined for as long as my memory goes back. We even went to prom together…as friends We have always kept in touch…but he’s been all over the world since he and Erin got married, and we have rarely been able to see each other. So when the opportunity came up to spend Thanksgiving with them…we jumped at it. We had such a fantastic, leisurely time with them…Shawn made “authentic” Starbucks caramel lattes for us whenever our little hearts desired and Erin and I cooked up a storm Potato Corn Chowder, Tofu Tacos, Fresh Spring Rolls (yum!). Kelli, Erin’s sister came over on Thanksgiving to spend the day with us. I had met her many years ago in Iowa, so it was great to see her again. The weather was so beautiful…and Bella loved being outside with Athena the Dog and swinging on the tire swing. 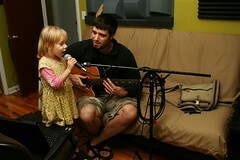 Matt and Shawn (and Bella) had fun playing in the music room. Shawn has a recording studio in his house…complete with a sweet harmonizing machine that automatically harmonizes with you when you sing into the microphone. It was crazy! Bella was pretty delighted with this little contraption and spend many hours in their singing with her daddy. Erin is pregnant with their first child so we had fun talking about all things birth and baby. We are so excited for them to reproduce…what fun to have a little mixture of them running around. It was such a blessing to have all that time to spend with them…it’s been so long. Reunions are great!